“Elements.” Nicola SANI: Wassererinnerungen (1996); Windstille (1999); Terra (2000); Con Fuoco (2002). Roberto Fabbriciani (bass fl, contrabass fl, hyperbass fl); Isao Nakamura (perc); Oscar Pizzo (org); Nicola Sani (electronics). Stradivarius STR 33766, 2CDs (http://www.stradivarius.it/). Distributed in the US by Allegro (http://www.allegro-music.com/). 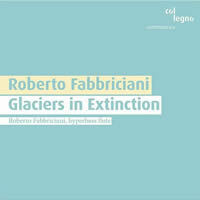 Roberto FABBRICIANI: Glaciers in Extinction (2005). Roberto Fabbriciani (hyperbass fl). col legno WWE 1CD 20254 (http://www.col-legno.de/). Distributed in the US by Qualiton (http://www.qualiton.com/). Sani’s elemental dreamscapes — one each for water, wind, earth and fire — blanket their soloists with live electronics and tape. Dissimilar materials coalesce, small details grow into obsessions, and unexpected shifts across the half-hour-plus spans contribute to disorientation. Organic concrete sounds dominate, although man-made artifacts such as ambient conversation, crowds, heavy breathing and crossing airplanes infrequently trespass. Wassererinnerungen’s tape hides flute, trombone and percussion. The live bass flute emerges prominently after the halfway point. Water noises haunt the periphery: Sani avoids the generic slap of beachfront waves, opting instead for what sounds like plunging divers or water sloshing in buckets. The taped trombone melts into fog horn and train noises. Windstille with solo contrabass flute and organ initiates a sinister pedalpoint which gradually transforms into a soothing bath. A rowdy conflict leads to an alien, wistful place. It’s only after extensive exploration of bowed metal that Terra’s percussion soloist arrives at the inevitable rhythmic beating, with monsoon rains (or an audience’s white noise?) accompanying the drumming. This and other nature-themed juxtapositions suggest Mâche. Fabbriciani is the series’ big draw, playing successively lower-ranged flutes in all but Terra. By the time we meet Con Fuoco’s low-frequency hyperbass instrument, we’re mingling with asthmatic mastodons. 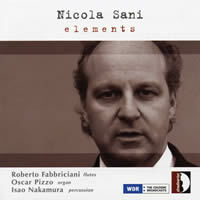 Fabbriciani’s own six-part Glaciers in Extinction for hyperbass flute and tape perpetuates Sani’s organic breathiness. It’s unclear how air ushering through hoses and the low harmonic rumble relate to the six movements: Glacier Ururashraju, Pasterze, South Cascade Glacier, Furtwangler Ice Wall, Carroll Glacier, and Chalcaltaya Glacier. I’ve only seen glaciers courtesy of resource-gobbling tours; I cannot say for certain whether additional, possibly unintended contradictions surface: Fabbriciani’s evocative title invites the contemplation of cycles of decay (or man’s destructiveness) with these nature pieces employing, perhaps a touch ironically, electronics and technology. 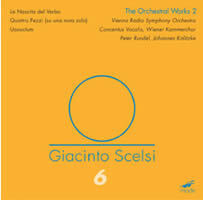 “The Scelsi Edition, Volume 6: The Orchestral Works 2.” Giacinto SCELSI: Quattro Pezzi (su una nota sola) (1959); Uaxuctum – The Legend of the Mayan City which they themselves destroyed for religious reasons (1966); La nascita del Verbo (1946-48). Concentus Vocalis, Herbert Böck (dir. ); Wiener Kammerchor, Michael Grohotolsky (dir. ); Vienna Radio Symphony Orchestra, Peter Rundel, Johannes Kalitzke (cond.). mode 176, CD or DVD-Audio (http://www.moderecords.com/). 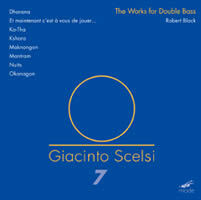 “The Scelsi Edition, Volume 7: The Works for Double Bass.” Giacinto SCELSI: Nuits (1972); Et maintenant c’est à vous de jouer… (1974); Ko-Tha, “Three Dances of Shiva” (1967, ed. F. Grillo); Dharana (1975); Maknongon (1976); Kshara (1975); Okanagon (1968); Mantram (n.d.). Robert Black (double bass), Felix Fan (vlc), John Eckhardt (double bass), June Han (hp), Tom Kolor (tam-tam). mode 188 (http://www.moderecords.com/). The quintessential Quattro Pezzi (su una nota sola) lay bare Scelsi’s techniques, aims and concerns. While Schoenberg, Boulez and Cage brought to the 20th century new organizational strategies, Scelsi sidestepped their advances through a fundamental reappraisal of pitch and instrumental color. Webern’s Klangfarbenmelodie may have arrived there first, however Scelsi went to an extreme by devoting entire movements to a single pitch. A primal force exhorts the Quattro Pezzi’s F, B, A-flat and A towards purity as 25 musicians, predominantly winds, snake though gouging harmonic shifts and microtonal distemper. His precisely notated scores explicitly specify quarter-tone inflections, types of vibrato, mutes, dynamics, etc. Crisp unisons materialize but are soon abandoned for eviscerating tremolos and detuned shrieks, thus avoiding the security of harmonic completeness. Intended or not, this mode orchestral release hangs heavy with the pallor of sickness and death. La nascita del Verbo preceded Scelsi’s mental collapse in the late 1940s. He cured himself, so the story goes, by continuously playing the same piano note for days on end. Oriental philosophy filtered in as well. Quattro Pezzi represents his recovery’s culmination. The anguished Uaxuctum’s subtitle, The Legend of the Mayan City which they themselves destroyed for religious reasons, perpetuates the obsessions. In their Quattro Pezzi, Rundel and the Vienna Radio Symphony position us cautiously at the abyss’ edge. The live recording enshrines coughs and shuffling, the effect of which diminishes choral aspirations in the eruptive Uaxuctum whose five movements careen towards destruction. After Quattro Pezzi Scelsi permitted himself a greater array of pitches, always handled with meticulous care. Uaxuctum writhes in the presence of death, its wailing ondes Martenot a stern sibyl. These DVD-Audio recordings possess the best clarity around, vastly superior to Hans Zender’s cautious 1978 Quattro Pezzi on cpo 999 485-2 or even Jürg Wyttenbach’s classic yet overly reverberant Quattro Pezzi and Uaxuctum on Accord 200612. This first recording of La nascita del Verbo suggests truculence. Its intoxicating jumble of expressionism, Wagnerian bluster and complex canons aligns it with similar creation myths by Leifs and Langgaard. Grandiose and colorful passages compare with Scriabin and Messiaen, with strange chorus murmurings suggesting B-movie sound effects. Beyond the work’s fervency, it’s hard to find the mature Scelsi, suggesting rather that he wasn’t quite all there. Scelsi solo and chamber pieces routinely stretch individual limits by requiring non-standard techniques from tapping to vocalization. On the surface, the works’ short lengths suggest miniatures, and yet, because Scelsi abandoned traditional forms and edged closer to improvisation, his works are expansive despite their brevity. The two-movement Nuits (C’est bien la nuit and Le Réveil profond) emerges as an abstract, somewhat traditional bass solo. Black’s riveting performance delivers floor-rattling low notes, the full-throated upper range betraying none of the nasality of Joëlle Léandre’s 1993 hat release (hat ART CD 6124). Ko-Tha requires that the bass be lowered to the ground and treated percussively. Black employs bassist Fernando Grillo’s arrangement of these Three Dances of Shiva, originally scored for guitar, to be played across the lap. In 1988, percussionist Maurizio Ben Omar used an amplified guitar on INA Mémoire Vive 262009. Black’s realization is darker, less attributable to a stringed instrument. Grillo’s 1976 performance on the second disc of col legno’s 50 Jahre Neue Musik in Darmstadt (set: WWE 4CD 31893; single disc: WWE 1CD 31895) seems preoccupied with exotic sound production and sits closer to works by Lachenmann, Xenakis and Cage in the same release (it’s also a single 7:13 track whereas Black clearly delineates three: 8:14, 2:19 and 3:44). Two duets receive their first recordings: the cello and bass Dharana and the double-bass duet Kshara. Titled in Sanskrit, both course slowly though quarter- and eighth-tones under precisely specified vibrato. Practically a palindrome, Dharana represents the initial stage in deep meditation. A delicately warped unison occupies Kshara’s center. Scelsi cleverly applies scordatura so that some notes resonate while others pass dully. The cello-bass duet Et maintenant c’est à vous de jouer… soars through long double-stops. Black’s gutteral cries in Maknongon will startle. Specified for “any low instrument or voice,” some performers take the less satisfying non-vocal route: Michel Tavernier on bassoon (ADDA 581 189), Uli Fussenegger on double bass (Kairos 0012162KAI), Giancarlo Sciaffini on bass tuba and Nicolas Isherwood’s bass voice (both on hat ART CD 6124). This latter hat release has a third realization, bassist Joëlle Léandre whose deep groaning unfairly suggests Yoko Ono. Scored for an odd trio of mistuned and amplified harp, bass and tam-tam, Okanagon clings to indeterminate nether regions recalling Mahler’s “Der Abschied”’s lugubrious halting opening. A central tapping episode reinforces Scelsi’s “heartbeat of the earth.” The set closes with the melodic Mantram which swirls both jazz and oriental languors. 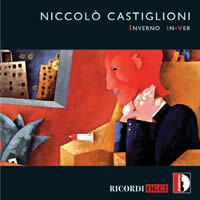 “Inverno in-ver.” Niccolò CASTIGLIONI: Inverno in-ver (1973); Quodlibet from Figure (1965); Quodlibet (piccolo concerto per pianoforte e orchestra da camera) (1976); Dickinson-Lieder (1977); Hymne (1988/89). Radio-Sinfonieorchester Stuttgart, Gianluigi Gelmetti (cond. ); Ingrid Ade-Jesemann (sop); Sakae Kiuchi (pno), Ensemble des Instituts für Neue Musik der Staatlichen Hochschule für Musik Freiburg, Giorgio Bernasconi (cond. ); Regina Kabis, Annette Noedinger (sop), Peter Hoffmann (pno); Schola Cantorum Stuttgart, Clytus Gottwald (cond.). Stradivarius “Ricordi OGGI” STR 57003 HAL (http://www.stradivarius.it/). Distributed in the US by Allegro (http://www.allegro-music.com/). 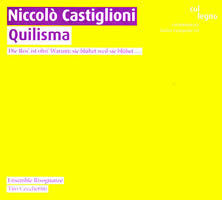 Niccolò CASTIGLIONI: Quilisma (1977); Tropi (1959); Consonante (1962); Daleth (1979); Risognanze (1989); Intonazione (1992); Cantus planus (1990-91). Sonia Adam, Elisabetta Lombardi (sop), Ensemble Risognanze, Tito Ceccherini (cond.). col legno WWE 1CD 20253 (http://www.col-legno.de/). Distributed in the US by Qualiton (http://www.qualiton.com/). With “Inverno in-ver,” Stradivarius reissues a 1991 Dischi Ricordi (CRMCD 1014) containing five Castiglioni pieces. The solo soprano Quodlibet is a quick, vibrant showpiece, and the other vocal pieces, settings of Dickinson for soprano with twinkling piano and a 12-voice Hymne may make less of an impression than the two purely instrumental works which broadly proclaim Castiglioni’s anti-Wagnerian stance. Its predominantly high tessitura meant to suggest winter, the 11-part title work marries irony with introspection. Castiglioni’s elegant instrumental pieces ramble despite themselves, tripping over partially remembered gestures and quotations, such as Beethoven’s Les Adieux motif. The piano concerto Quodlibet meanders with its head elsewhere, occasionally blurting out innocent, nursery-like tunes. At first glance, col legno offers solemn Castiglioni. The earliest pieces, Tropi and the flute concerto Consonante, bristle like their contemporary Darmstadt brethren. However, Quilisma and Daleth are built like wide-patterned quilts. The sectional piano quartet Quilisma flirts with bird song, as does Daleth, a strange clarinet sonata where the woodwind opens with infrequent staccato shrieks. Pranksters both, Intonazione and Risognanze take ironic poses often exploiting tonal material in high-pitched collage. Risognanze’s opening La notte riffs Webern’s short orchestral pieces. 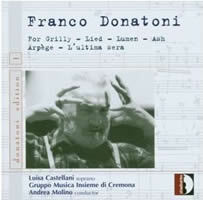 “Donatoni Edition 1.” Franco DONATONI: For Grilly (1960); Lied (1972); Lumen (1975); Ash (1976); Arpège (1986); L’ultima sera (1980). Luisa Castellani (sop), Gruppo Musica Insieme di Cremona, Andrea Molino (cond.). Stradivarius STR 33315 (http://www.stradivarius.it/). Distributed in the US by Allegro (http://www.allegro-music.com/). Franco DONATONI: Leoncavallo (1996); Cloches II (1990); “…a Renzo e Marcella” (1990); A Françoise (1983); Rima (1983); Estratto (1969); Black and White No. 2 (1968); Tre improvvisazioni (1957); Composizione in quattro movimenti (1955). Maria Isabella De Carli, Mariarosa Bondini (pno). Stradivarius STR 33627 (http://www.stradivarius.it/). Distributed in the US by Allegro (http://www.allegro-music.com/). Stradivarius has re-released an essential Donatoni album, teasingly marked “Donatoni Edition 1.” Spanning a wide chronology, six compositions demonstrate Donatoni’s manic luminescence. The 1972 Lied is a particular favorite with its closely knit pairs (two each of violins, violas, flutes and clarinets with celeste, harpsichord, piano, harp and vibraphone). Ash, Lumen and Arpège represent Donatoni’s characteristic colorful, frenzied bustle. L’ultima sera is the big work, eight settings (Fernando Pessoa) for soprano and “Pierrot” ensemble. Sprightly motivic cells evolve through overlapping tessituras, contrasting sustained notes with short attacks. These 1992 performances still shine. 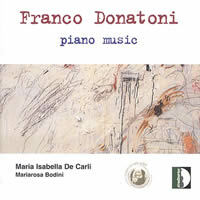 Works for one and two pianos chart Donatoni’s development. The high points are Rima and the two-piano Cloches II, examples of this influential Italian’s extended mature style. The late miniatures Leoncavallo, A Françoise, and “…a Renzo e Marcella” reveal Donatoni’s fertile invention amid characteristic, fast fragmentary gestures that tumble in narrow tessituras. Rarely heard Darmstadt trinkets close this disc, but despite De Carli’s convincing execution, the 1950s Tre improvvisazioni and Composizione in quattro movimenti dressed in Webern-Boulez-Dallapiccola cast-offs have little staying power. The two-piano Black and White No. 2 admits chance, while the 1969 miniature Estratto heralds Donatoni’s mature style. 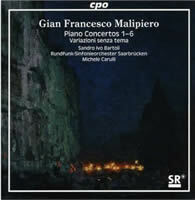 Gian Francesco MALIPIERO: Complete Piano Concertos; Variazioni senza tema. Sandro Ivo Bartoli (pno), Rundfunk-Sinfonieorchester Saarbrücken, Michele Caruli (cond.). cpo 777 287-2, 2 SACDs (http://www.cpo.de/). Distributed in the US by Naxos (http://www.naxos.com/). With their modest melodic forays and modernist verismo touches, Malipiero’s six concertos, each in three movements dispatchable in under 20 minutes, tend to blur together if taken chronologically. Modal rhapsodizing lends antique touches to the 1934 First and 1937 Second. The central slow movements are always the longest and most expressive, especially in the 1948 Third. The modalities suggest Bartók and Martinu, especially in the 1950 Fourth and the sober 1958 Fifth as Malipiero’s language hardens; by 1964 the Sixth approaches succinct, icy Hindemith. The set closes with the Romantic 1923 Variazioni senza tema. Bartoli executes with a bubbly romantic touch, and the Saarbrücken players join with vigor.